First impressions of this beautifully-bound book? Aside from the fact that it’s so little and so velvety smooth it makes you want to snuggle it to your chest like a newborn kitten? Don’t let the publication’s elfin size fool you. 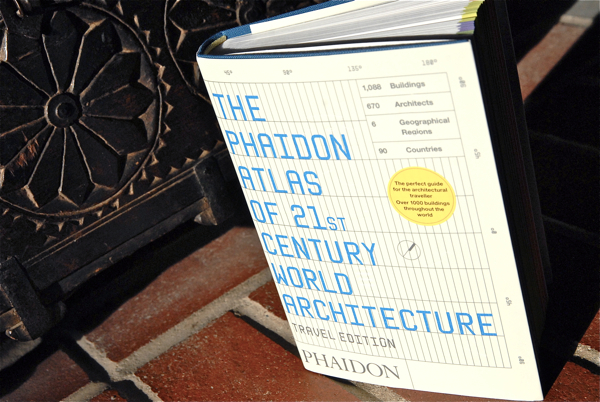 Leaf through its pages and you’ll see the Phaidon Atlas of 21st Century World Architecture: Travel Edition is so much more than just another cute collectible. Given who we are, we dove straight into the section featuring Canada. Which Canadian buildings, we wondered, were deemed destination-worthy by this renowned British publishing house? Sixteen Canadian projects were listed. Among them were Toronto’s Ravine Guest House (featuring an indoor/outdoor fireplace with a view to a forest), Ottawa’s Canadian War Museum (made with re-purposed copper) and the stunning, multi-coloured Montreal Convention Centre featured in the photo above. Like the publication that inspired it (a larger coffee table version printed in 2008) – this atlas will appeal to architecture enthusiasts around the planet. As for the rest of us? We’re convinced there’s something here – if even for the mildly curious. Maybe you want to expand your vocabulary and impress your friends at the next cocktail party. Cantilevered upper-stories? Grids of louvres? Entrance forecourts? Whaaaaa??? Or maybe it’s the images you’re after. And you’re simply happy to curl up with this beguiling little publication, flip through its pages and feast on some seriously inspiring photographic eye candy. ***OK. We’re prepared to give away, albeit grudgingly, our copy of this wonderful little book. All you have to do is tell us about your favourite Canadian work of architecture and why you love it so much. Best comment wins. Contest is open to midnight Dec 14/11. ***Contest update: Congrats to Colette for nominating UBC’s Museum of Anthropology as a destination-worthy “Canadian work of architecture.” And thanks to those who took the time to comment – putting great buildings like the Chateau Frontenac in Quebec City, Ottawa’s National Gallery of Canada and The Young Centre for Performing Arts in Toronto on our radar. Great recommendations! The Young Centre for the Performing Arts by KPMB (in Toronto)! It displays Canada’s industrial past while introducing an exciting multi-use program of performance, lobby, cafe, bookstore… The innovative use of wood makes anyone (not just Canadians!) feel warm and at home in this building and the exposed brick constantly reminds the visitors of the history of the surrounding Distillery District buildings. The perfect combination of materials, composition, historical reference, and modern program to showcase true Canadian talent! Toronto’s Ravine Guest House is my dream house! There is more I can say about this amazing space, but instead, I think I will just say, “ahhhh…” I have been dreaming of having the house that reflects a beauty of nature. It has large wood-and-glass doors unfold and a water pool surrounded by a beautiful forest. Watching it, though, makes us calm and peaceful. The harmony of the terse architecture and the beautiful landscape will make anybody who visits there happier! I love type Canada’s National Gallery in Ottawa. Beautiful glass facade and stunning interiors. It’s a destination. I would also love to see a book on amazing streetscapes and not just buildings. The Chateau Frontenac in Quebec City. I love this building! It is not only soaking in history, especially with such deep roots in the history of the Canadian Pacific Railway but Alfred Hitchcock filmed I Confess there. Even though the building was designed by an American architect it has, to me, a very French Canadian look to it. The green roof like our Parliament, the red brick and the chateau style, perched on top of a citadel for all to marvel. If Quebec City is the oyster, Chateau Frontenac is the pearl. I truly love the Museum of Anthropology at UBC in Vancouver. I remember going there as a child and the spaciousness was seemingly immense with these wonderful totems staring down at me. Later in life, I graduated with a degree in Archaeology and worked in the archives at Cambridge University Museum of Archaeology and Anthropology. The rooms there were so dark and foreboding. Interestingly enough, they held many First Nation artifacts from the B.C. coast. I am not convinced that I would have been so inspired by that as I was by the museum in Vancouver. Isn’t that what architecture is supposed to do? Inspire?